Dorothy Day (1897-1980) was a well-known American journalist, activist, and Catholic convert whose cause for sainthood has been endorsed by the US bishops. She wrote numerous articles over a period of several decades for the prominent lay Catholic magazine Commonweal. Hold Nothing Back is gleaned from those writings. It includes reflections on her life as a single mother, her time in jail for civil disobedience, her struggles to keep the Catholic Worker movement she cofounded afloat, and her travels on crowded buses to report from the front lines about labor disputes, racial inequality, and poverty. At the heart of whatever Day wrote lies a profound and prophetic faith. Hold Nothing Back—a new, abridged edition of the previously published Dorothy Day: Writings from Commonweal—gives a glimpse of her remarkable humanity and endurance, and of the vibrant spirituality that underlay them. 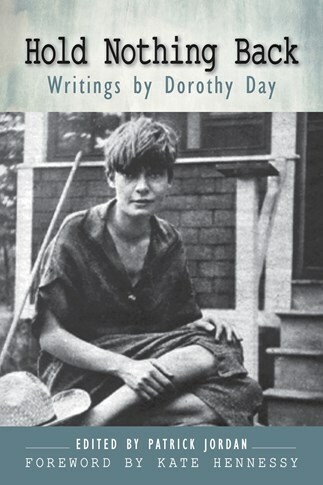 "In these times when social concerns are so important, I cannot fail to mention Dorothy Day. Her social activism, her passion for justice and for the cause of the oppressed, were inspired by the Gospel, her faith, and the example of the saints." Patrick Jordan is a former managing editor of The Catholic Worker. He and his wife Kathleen were associated with Dorothy Day from 1968 until her death in 1980. From 1984 to 2012, Jordan was an editor at Commonweal magazine. He is the author of Dorothy Day: Love in Action (Liturgical Press, 2015), editor of Dorothy Day: Writings from Commonweal (Liturgical Press, 2002) and, with Paul Baumann, coeditor of Commonweal Confronts the Century (Touchstone, 1999). He serves on the advisory board of the Dorothy Day Guild. Dorothy Day is the relentless prophet of justice for our time. In these historic essays, she reminds us that great political action against oppression is driven by religious faith, especially faith that invites us to profound trust, to humble poverty, to doing the smallest of tasks with the greatest of loves. Day's words are charged with anger and discontent just as they are filled with the spark "that would set afire the love of men towards each other and to God." From motherhood to itinerant teacher, she is in the end, our prophet of love-"love to the point of folly"-love that is both childlike and painful, both restless and intimate, always a witness to the gospel without exception and without apology too.